Often acclaimed as the Dean of West Coast design, this unassuming and personable designer exhibits none of the diva-like traits that are often expected from design luminaries. His attachment to “keeping it small” is driven by the need to stay involved in every step of the design process, while his long-felt love of art imbues his work with an aesthetic that defies the norm. Respected by peers and appreciated by clients who reward the partnership with multiple projects, Gary Hutton justifiably lays claim to the rarefied community of the Bay Area’s design elite. I was born and raised in Watsonville, California on my grandmother’s apple orchard. My dad was an engineer, driving trains for the railroad; my mother a homemaker. That’s where I lived until I went to college. It was a traditional country upbringing. I was even the head cheerleader at Watsonville High School, State Champions, I might add. I took Art at Cabrillo Junior College as I debated pursuing Art or Interiors as a career choice. I transferred to U.C. Davis during the Golden Age of its Art Department, and studied for a Bachelor of Fine Arts degree under a number of luminaries—Wayne Thiebaud, Manuel Neri, Bob Arneson, Bill Wiley. It was a magical time. I took to it like a fish to water. I kept thinking, “These are my people”. After I graduated Davis, I got a commission with an advertising agency to do a sculpture for their offices on Sacramento Street. But that wasn’t enough to live on so I worked in a clothing store, a book store and a mall before deciding that Interiors was something that I was interested in. I knew that CCA offered a reputable program, so I enrolled for an Interior Design degree. In between CCA and starting my own design practice in earnest, I did a variety of projects—sample boy at Scalamandre; working the CJ Welch showroom; and a stint in what was then Macy’s interior design studio. My big break came when I was asked to design a new restaurant in Union Square called Today’s that drew San Francisco’s most sophisticated and glittering audiences. The project was published in Interior Design Magazine and that’s what got me noticed by the design world. All of a sudden, I went from sample boy to designer who attracted the attention and respect of design luminaries like Orlando Diaz and Charlie Pfister who lunched at the restaurant. I opened my practice with a small apartment design for a friend as well as a restaurant design for Sak’s (which never eventuated). For twenty years, I operated out of my apartment—just me and my bookkeeper. My design aesthetic originates from my art background and training. Touch and feel are very important. It’s like textiles —how does this fabric feel? What’s it going to look like? How is it going to perform? I’d describe my style as clean, modern and experimental. For example, in 2010, we did the master suite in the Met Home Show house. We designed a partition — but it was composed of bars of soap—in the best Andy Warhol tradition. It sprung from the idea that nothing has to be “precious”. Frank Gehry did these beautiful cardboard tables that Vitra was making, and we borrowed what we thought were two sets for the nightstands. Two days before the show was to open, we were only given one set. So, we made the other one. We took discarded cardboard boxes, cut them into pieces, stacked them, and encircled them with big rubber-bands. On one side, you had this very refined piece crafted by Gehry, and on the other side, a pile of cardboard with rubber-bands. It created quite a stir. People wanted to buy them. Recently, my client Chara Schreyer hosted the Board of Trustees of MOMA New York at her house in Los Angeles and asked that I be there as the person responsible for its design. It was an amazing experience because attending were luminaries such as David and Susan Rockefeller, Maria José Kravis, Mrs. Pulitzer and the Cisneros. That was bliss for me, because in my mind I’m still a country boy from Watsonville, and suddenly I’m having a lovely conversation with David Rockefeller. Mrs. Rockefeller sent a thank-you note to Chara and waxed elegant, not only about Chara’s astounding collection, but also about the design of the house and how thoughtful and interesting it was. Money is wonderful, but I’m motivated by the work. I like to do it, and I think it’s one of the reasons that I’ve never aspired to bigness. At one point I had six employees, and I discovered that I was only managing; I wasn’t getting to do the work. It’s the creative act that really drives me. I could have made a lot more money had I gotten larger, but I gave up size for creativity and control. I’m always in search of the client who is willing to take some risk–try something new and different. We currently have a project in Los Altos where most of the design will be relatively conventional, but they said, “The powder room is all yours. Do whatever you want in there.” We’ve devised a Yayoi Kusama-like installation piece, where there is mirror reflecting on itself. You get this sense of infinity with LED lights that wrap the floor, the ceilings and the walls. It’s going to be a wonderful piece of experiential design and inspirational art. I love doing that. I started designing furniture as an outlet for my sculptural tendencies–the idea of designing items of beauty and seeing them come to life. I also saw it as a means of generating additional revenue without the commitment of individual time that interior design demands. We do it all ourselves, from concept through the delivery, with artisans who construct and manufacture, and showrooms that rep the product line. We did an apartment at the Four Seasons that had to house an incredible art collection. We had complete creative freedom, and there were no domestic considerations because no one was going to live there. The apartment was essentially an intimate museum for the client’s art collection. We did the restoration for an A. Quincy Jones house on the lagoon in Belvedere. The house had been un-sympathetically remodeled, and we able to get the plans from Mr. Jones’ widow which enabled us to restore the house. A “creative restoration” was how I would describe it. We utilized materials — that had they been available at the time of the home’s initial construction, would have been used. The restored house was also used to store an art collection from the ‘60s and the ‘70s, and so it gave me a platform to create a stage set. We were able to use really early George Nelson furniture and carpet designs from Raymond Loewy, as an example. I vividly recall a former bank headquarters designed by Charles Phister in downtown San Francisco that made an incredible use of luxurious materials in a commercial setting. I had never seen anything like that before. The president’s office had walls upholstered in Aubergene mohair velvet with Matisse drawings hanging on them. And private conference rooms that were round. 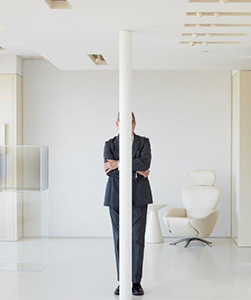 Inside one conference room, there was a cylinder that came down from the ceiling to the nine-foot level, and from nine feet all the way up, were tubes of multicolored silk that formed rainbow effects. There was a project that Orlando Diaz did in Embarcadero Center. Again, he had applied a residential thought process to a commercial space. The waiting room was elliptical-shaped, and the walls were upholstered with raw silk. There were niches with giant blue and white Chinese jars. The secretarial areas all had typewriters in those days, and he had designed special inset pads under the typewriters and on the wall right behind the typewriter to absorb the sound. 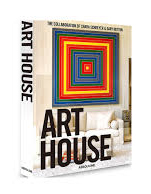 Editor’s note: Art House, published by Assouline, and written by Alisa Carroll, editor in chief of SFC&G, chronicles leading art collector Chara Schreyer’s forty-year collaboration with Gary Hutton which has produced five residences designed to house six hundred works of art. It started out with Matthew Millman, the photographer, who wanted to document my client Chara’s collection. 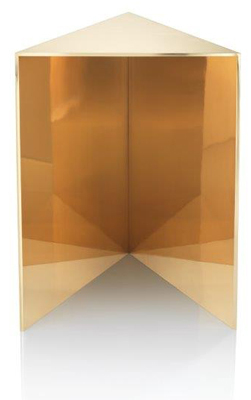 Without a doubt, it is one of the top ten private contemporary art collections in the world. We started talking to a book agent from New York who did some research about Chara and me, and our partnership. Her feedback was, “A book with pictures of a rich person’s art collection, nobody will ever buy. The real story here is that Gary and Chara have worked together for almost 40 years, and they have done these five houses that hold this collection. That’s the story.” That’s how the book morphed into what it is. It’s gone to second printing. Alisa and I did a book signing in Paris in January, and the manager of the Assouline store in Paris said it was the #1 seller of the holidays.